What’s it like to live and garden in Minneapolis, Minnesota? 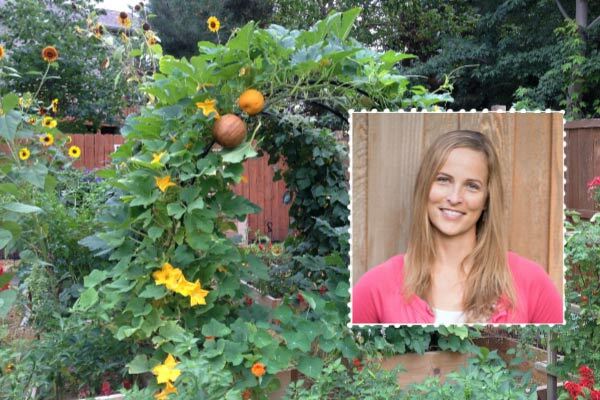 Amy Andrychowicz of Get Busy Gardening is giving us a glimpse of gardening life in this midwestern state. Growing I enjoy growing vegetables, herbs, annuals, perennials, succulents, tropical plants, and houseplants – you name, I’ve grown it! It’s not a very exciting story! 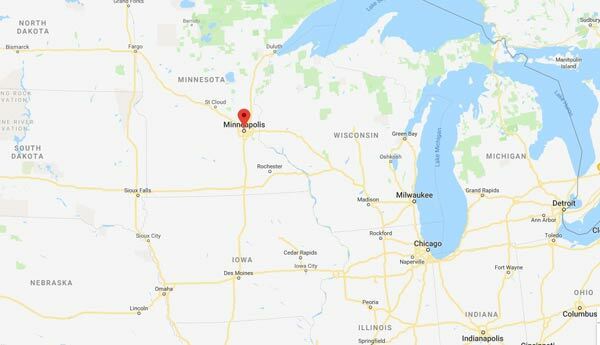 I grew up in Minneapolis, and have lived here in Minnesota most of my life. I went to college just north of the city, and also lived in San Diego for a year. Other than that, I’ve always lived in the Minneapolis metro area. I get my green thumb from my parents, and I’ve been gardening for most of my life. My love of houseplants comes from my mom, and my love of outdoor gardening comes from my dad. I’ve always grown houseplants, and have had some kind of a garden everywhere I’ve ever lived – even if it was just a few containers on a tiny balcony back in the days when I lived an apartment. The house I live in now is the first home I’ve ever owned. When we moved here, the yard was pretty much all lawn. The “landscaping” consisted of a few bushes and some ugly hostas plopped in front of the house. Over the years, we’ve transformed our boring suburban yard into a garden oasis by adding several flower gardens, a large vegetable garden, a tropical garden, a rain garden, a Zen garden, two ponds, and many unique hardscape features – all of which were DIY projects. Since it was a pretty new neighborhood when we moved here, I had full sun everywhere except for a few areas next to my house. I didn’t’ know how good I had it until the fences started going up and the trees grew taller, slowly turning many of my full sun gardens into shade gardens. That’s been a huge learning experience (and super frustrating at times), and I’ve had to relocate many plants to sunny areas over the years. But there are many benefits too. The sandy soil is wonderful for growing, and we have lots of space to work with. Plus starting with a blank canvas was a pretty awesome experience! 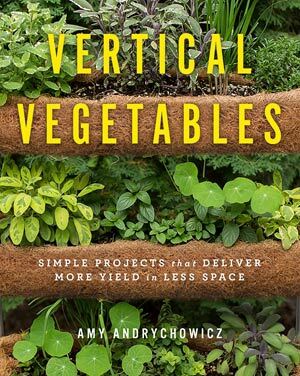 Cool Springs Press is kindly sponsoring this giveaway of TWO copies of Amy’s new book, Vertical Vegetables. See how to enter at the bottom of this page. CONGRATS to Avis F. and Mic Dawson who both won copies of the book. I guess the biggest thing that comes to mind is the appreciation for nature and bugs. Haha! I grew up in the city, so suburbia is a whole different ball game, and there are a LOT more bugs out here. I used to hate any type of bug and wanted them all gone. I still don’t love bugs but have grown to appreciate their importance in my garden. Being as organic as possible has become even more important to me now that I understand the delicate balance of good bugs -vs- the pests in my garden. Oh man, I could probably write a book! I have learned so many things by trial and error, and it’s definitely made me a better gardener! But since I just got done writing my first book Vertical Vegetables, the story about the first time I grew pole beans in my own garden is fresh in my mind. Right after college, I was living in a rental house that had a few small garden beds, and I was excited to try gardening on my own for the first time. I have fond memories of eating green beans fresh from the vine as a kid, so I decided to grow those. I planted the entire packet of seeds in a small bed (about 2’ x 4’, if that), and patiently waited for them to grow. I was super excited once they started growing, but it didn’t take long before I realized I needed to give the fast-growing vines some kind of support. I found a few wire tomato cages in the garage, so I used those, and carefully trained my little green bean vines to grow up the cages. LOL! I think that lasted two days before the vines outgrew the cages. In the end, the vines grew up the legs and railings of the deck, and all the way up the stairs. I was completely overwhelmed by the amount of green beans I harvested too! I remember bringing buckets full of beans to work with me every day, and trying to pawn them off on my co-workers. That was the summer I learned a lesson about vertical gardening, and also about the importance of plant (seed) spacing. For the past year and a half, I’ve been crazy busy working on my first book, Vertical Vegetables. So vertical vegetable gardening has been my obsession, and the main focus of everything in my garden for the past two summers. 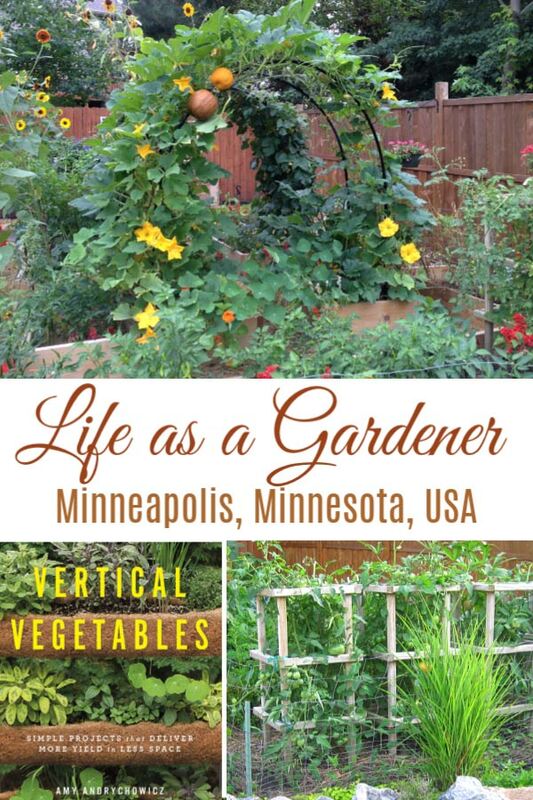 I had the pleasure of designing and building 23 DIY vertical gardening projects for the book. I’ve also been able to experiment with growing all kinds of vegetables vertically in fun and unique ways (not just pole beans!). Since focusing on growing vertically so much, and building several new structures in my gardens, it’s really changed the way I’ve been growing food. On Get Busy Gardening, I want visitors to find ideas and inspiration, and to gain knowledge and the confidence to turn their dream garden into a reality. There’s no such thing as a black thumb, anyone can be a gardener! Just have fun with it! And for goodness sakes, don’t be so afraid to kill a plant now and then, or have an epic failure in the garden! It happens to everyone (whether they admit it or not). It’s all a part of the learning process. Test the soil before you plant anything. Most new gardeners don’t realize that everything starts with the soil, and many of the failures they experience are because of problems with the soil. It’s easy to do using a home soil test kit, here’s how. Second, mulch your gardens! It’s the best way to control the weeds, makes watering easier, and can also prevent soil borne diseases. Learn how to mulch your vegetable garden here. Lastly, start small. One of the biggest mistakes that new gardeners make is that they get really excited about growing all their own food or having beautiful flower beds, so they dig up a huge area in the spring. Then they become overwhelmed once the weeds and bugs start to appear in mid-summer, and usually give up by fall – completely defeated and feeling like a failure. That’s not a good first experience! If you’ve never gardened before, just start with a small bed, and add to it as you get the hang of gardening. 1 YES! My new book, Vertical Vegetables is jam-packed with tons of DIY projects that will keep you busy for several rainy afternoons! 2 My DIY squash arch has been a huge hit, and looks amazing in the garden! 3 Painting terracotta pots is also a really fun project for a rainy day! Two winners will be selected: prize is Vertical Vegetables by Amy Andrychowicz. Retail value is $30US. Tell us the name of Amy’s new book. Some comments are held for moderation and published later. And, thank you, Amy, for sharing your garden life with us. Vertical Vegetables is the name of her new book. I live in Texas. Amy’s new book name is Vertical Vetgetaables. I am Glenda from Oregon!??? Amy’s new book is Vertical Vegetables. I live in Maryland. Hello from Orlando Florida! I would be tickled if I won a copy of Amy’s new book “Vertical Vegetables”. I hope to start my New Year off doing what I dream of which is gardening. Thank you and Happy New Year! 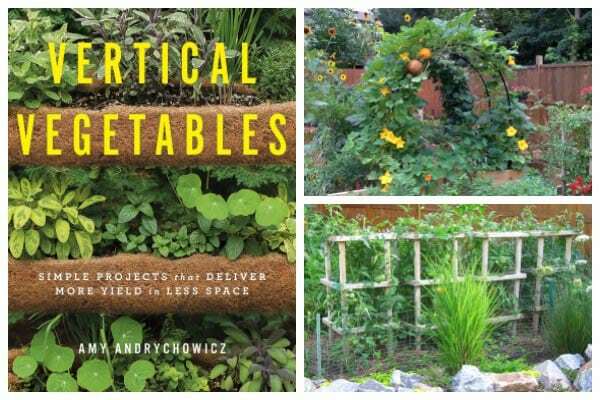 Since moving to Ohio we’ve found that our yard doesn’t provide enough area to garden effectively … the book Vertical Vegetables looks as like it would be the answer to our problems ! Vertical Vegetables. I am from Nova Scotia.